The Berkshire Unit are one of the first units to return from ‘Camp in Camp’ where each of the four patrols headed off-site, on coaches bound for unknown destinations, to join Scout groups across Sweden on their own camps. DESTINATION UNKNOWN: We had no idea where our buses were bound, nor who we'd be camping with. Once we’d packed the things we’d need for the next 24 hours, we headed to the edge of the Jamboree site where the coaches would pick us up. There were a dozen other units there too, so there was a period of waiting for those to bundle onto the buses that quickly came and went, but eventually we were off. After an hour’s drive, we were dropped off at the 27-acre Hörrs Nygård camp site. We were met by a group of Finnish Scouts who’d act as our hosts, though other groups (including a UK Scout troop, tracing the UK Contingent’s footsteps) were there too. Having been promised that we didn’t need to pack tents, we were keen to find out where to lay down our sleeping bags. 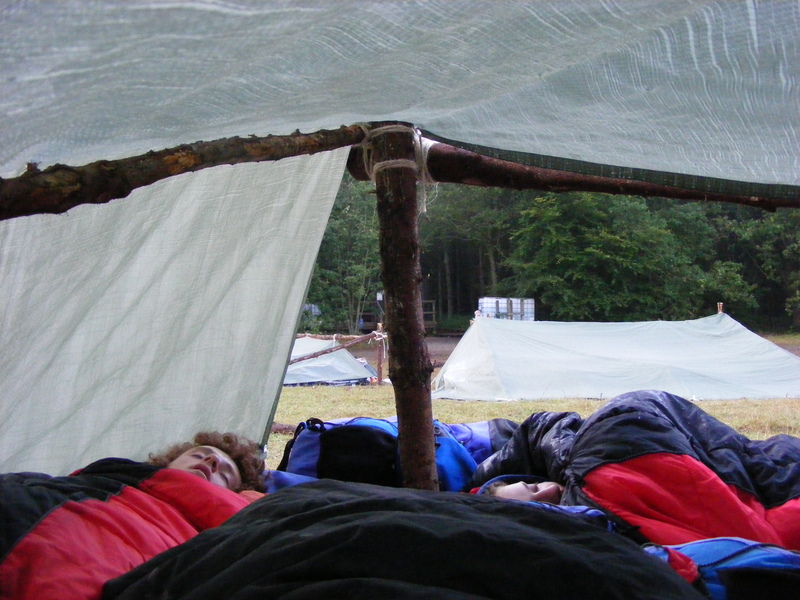 It transpired, though, that our first task was to erect a shelter, which we set about doing with a sheet of tarpaulin and some wood. The other units, also sent from the Jamboree, were having to do the same too, though they seemed to make a far better job at it than we did, and ours ended up being extraordinarily low. PUT YOUR BACK INTO IT: Daniel Thomas helps build the shelter. BREATHE IN: Our rather tight make-shift shelter. After teaching the rest of the Scouts a number of games, and learning new ones from the others, we moved onto our main task. 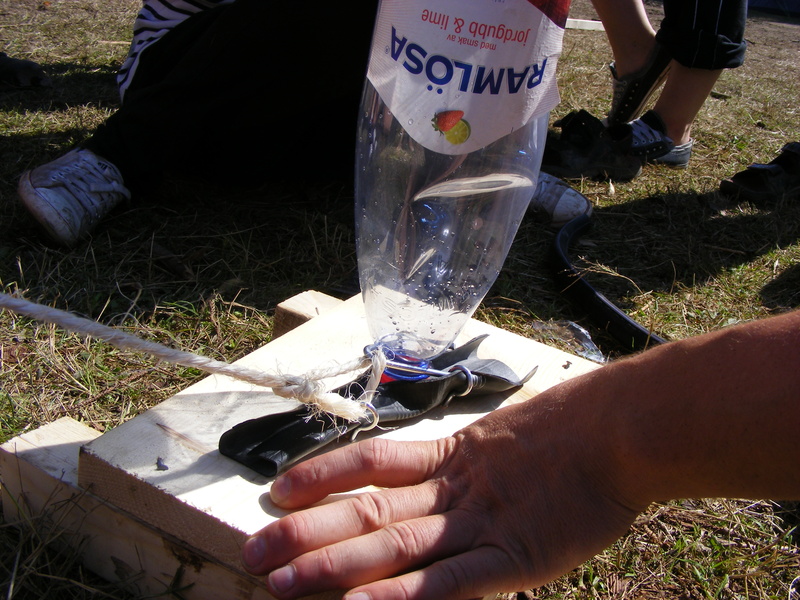 Given plastic bottles, bicycle pumps, and wood, in groups of eight we made water rockets and launch-pads. As one may expect, the female half of the group quickly split off to design the rocket’s artwork, whilst the males went for the more engineering side – though it was joked that the girls may have made a better job of the latter role than the chaps! LAUNCHPAD: A dummy, undecorated rocket ready for launching. In the evening, we cooked pasta and beef for dinner, slightly adapting a recipe from the Jamboree Cook Book. DINNER ON A PLATE: The pasta and beef dinner, enjoyed al-fresco in the Swedish sun. That night, Daniel, Alec (my APL), and I built up our cooking flames into a campfire, and then Simon (my patrol’s adult leader) and I led the resulting singing and chanting. 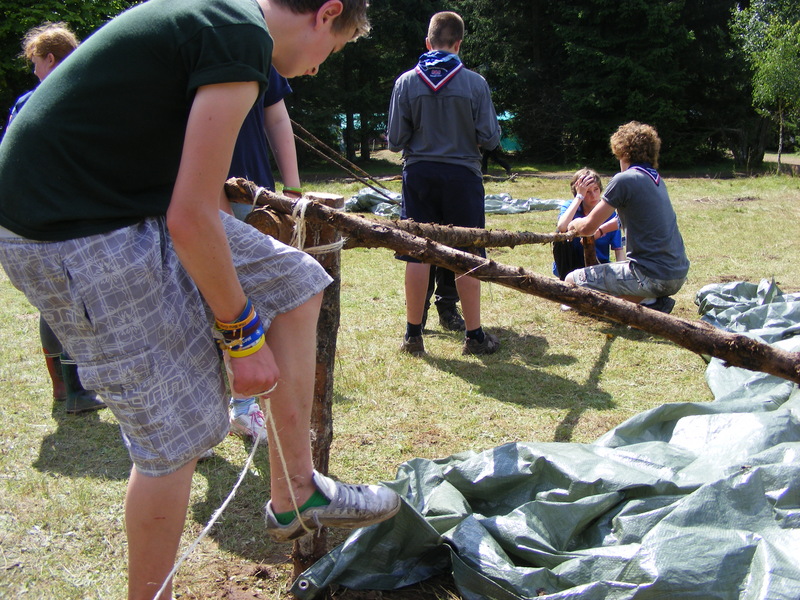 I even tried out a version of Ride That Pony, inspired by German Scouts playing a similar game earlier in the day. Following the lively campfire, we crawled into our beds, ahead of an uncomfortable night’s sleep in a sleeping-bag full of ants. 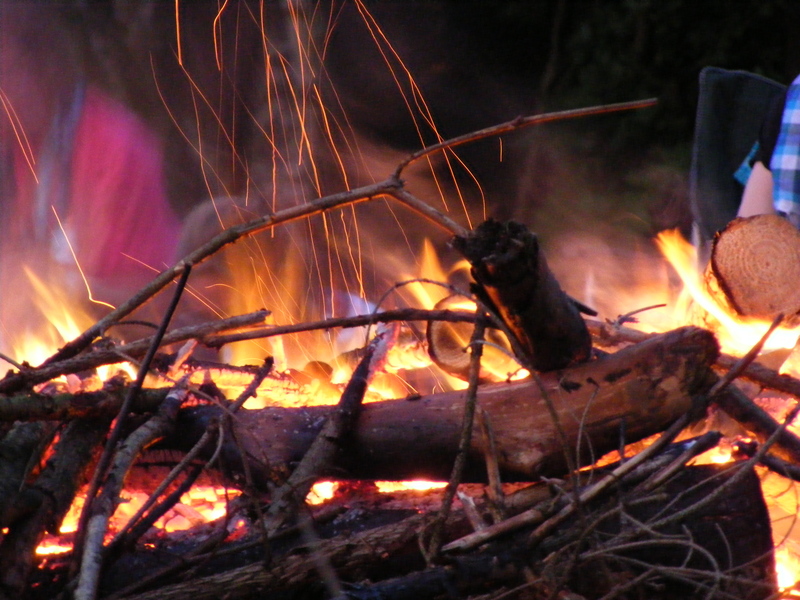 ROARING FLAME: The campfire burning, as singing and jolliness happened around it. 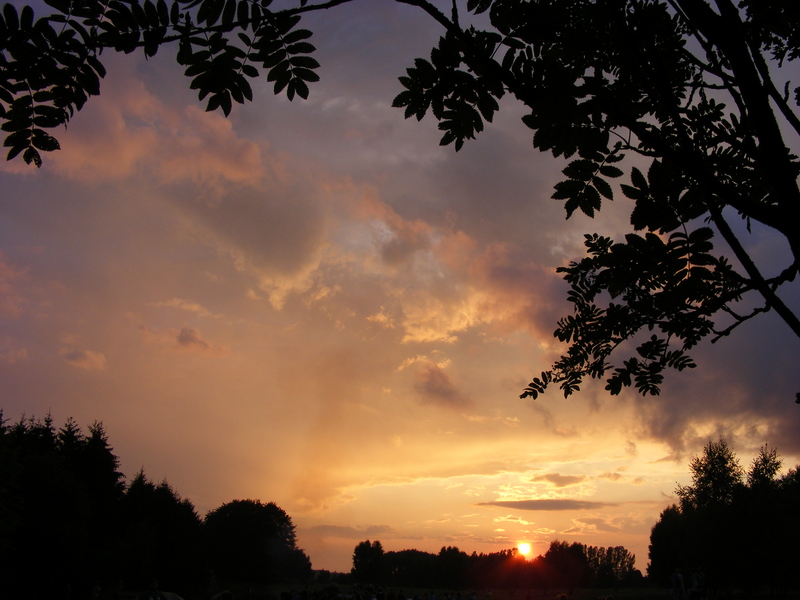 STUNNING SUNSET: The sun setting over our campsite, during the campfire. We all woke up on Monday morning feeling damp. It wasn’t raining, but the morning dew had seeped through the thin piece of canvas above us, and covered the ground around us. However, once we’d got a fire going, we quickly warmed up. MORNING DEW: We awoke in dampness as a result of the dew. Sadly, the bread rolls we’d packed had been slept on, and were consequently a bag of breadcrumbs. Fortunately, a ‘snack-shack’-type shop was on the other side of the campsite, and we were able to enjoy a chocolate bar breakfast, with Fanta in place of Florida orange juice. The morning’s entertainment was a mini-Olympics activity, where each team competed against another at various ‘events’, ranging from throwing balls in a bucket, to long-jumping. AT IT GIRL: Assistant Patrol Leader Natalie throws a ball in a bucket, during the mini-Olympics event. 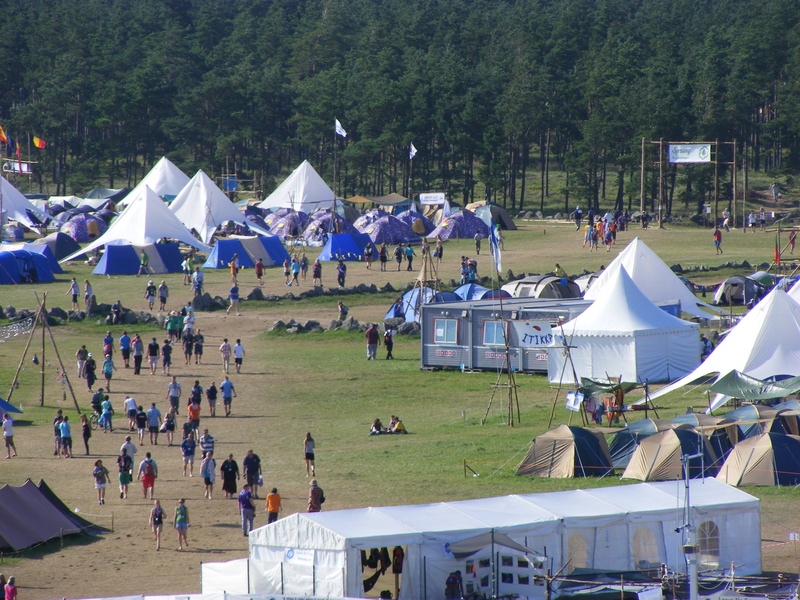 At 11:00am, after saying our goodbyes and thank-yous to our hosts, we carried our bags to the end of the track, and were taken back to the Jamboree site, which – for the first time – was basking in sunshine. LONG WALK BACK: Three patrol-members walk down the track to wait for the coaches. WHAT A BEAUTIFUL DAY: Looking out over our area of the campsite, basking in the glorious sunshine, from the 30-metre observation tower (made out of pioneering poles).